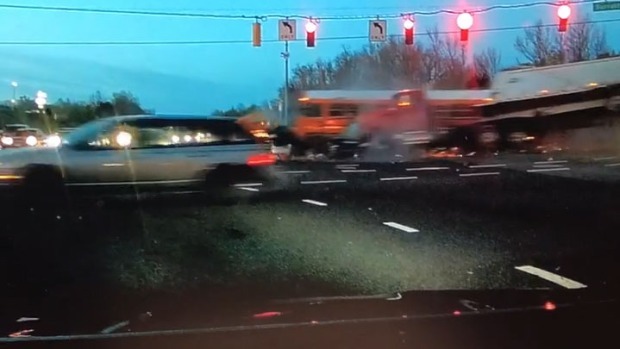 Six people, including two high school students and the bus driver, were taken to the hospital with injuries that are not considered life-threatening, Prince George's Fire Department spokesperson Mark Brady said. Two people refused transportation to the hospital. A preliminary investigation shows that a tractor-trailer was traveling south on Route 5, or Branch Avenue, and all other vehicles were travelling near the intersection on Surratts Road when the crash occurred about 6:15 a.m., police say. The school bus was headed toward Charles H. Flowers High School, Prince George's County Public Schools says. Video shows it was struck on the side and faced serious damage to the front. The truck was knocked onto its side, spilling its contents over the road. A Hyunday was smashed between the bus and the truck, badly mangled. The driver of the Hyundai was killed, police said. Her body was extracted after several hours. Witness Marvin Simpson, who caught video of the impact on his dashboard camera, said the driver of the truck quickly climbed out and went to check on the car. The truck driver's wife, Jeanine Guzman, said her husband is a safe driver who has driven trucks for a long time. "He doesn't smoke; he doesn't drink. Nothing," she said. Prince George's County Police Chief Hank Stawinski pointed out that the intersection is sloped on each side and compared it to the bottom of a bowl, making it extra dangerous. "If you're texting while driving, if you're not buckled up, this is one of those places that because of the geography you can have worse outcomes," Stawinski said. A hazardous materials team was called to clean up fluids leaking from the vehicles, Prince George's County Fire said. All southbound lanes were closed during the investigation and clean up; only one northbound lane was open for a time. 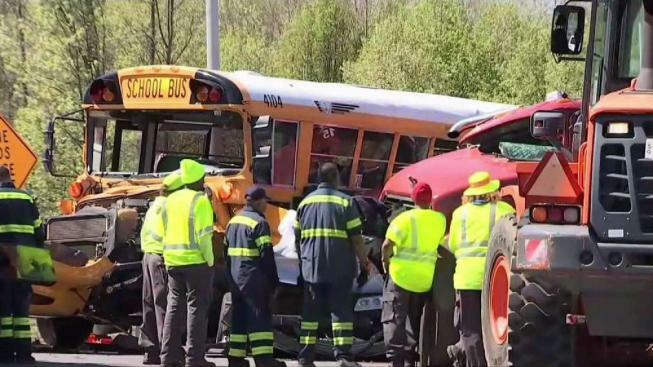 Maryland State Police initially said there were no students on board the bus.